Gurbaksh Chahal is founder, chairman and CEO of RadiumOne. Growing up in gritty East San Jose, Calif., Gurbaksh Chahal struggled to fit in. Emigrating from India with his family at age 4, he wore a traditional head covering for Sikh children called a patka to school. It was just one cultural difference that his pint-sized peers bullied him about. But instead of succumbing to what he recalls as a "wild, wild west for minorities," Chahal leaned into his close-knit family for the strength that would become his entrepreneurial fuel. He dropped out of high school at 16, started a business and never looked back. Fascinated by online advertising and the "concept of a click," Chahal founded ClickAgents in December 1998. Less than two years later, he sold it for $40 million. Staying hungry for growth, he started online advertising network BlueLithium in 2004. Yahoo Inc. bought it within three years for $300 million. The latest entrepreneurial venture for Chahal, now 29, is RadiumOne, a fast-growing ad network that leverages social data on the Web. In this interview with 'Trep Talk, Chahal's tone is sharp and determined, yet quickly softens when he speaks of family. The serial entrepreneur, who also published a memoir, The Dream (Palgrave Macmillan, 2008), offers insight on staying competitive, making the most of defining moments, and the one thing he changed that shifted his outlook on life. Edited interview excerpts follow. On breaking free from bullies: My focus was to think: 'OK, I'm not going to have the most friends, be prom king or the most popular student – but so what?' I fell in love with the Internet, with business and the idea of being in control and knowing that my destiny was in my own hands. I became more determined than ever to succeed. 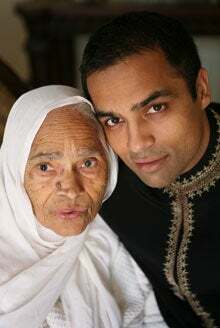 Gurbaksh Chahal pictured with his grandmother, Bibi Surjit Kaur, in 2008. I'm inspired by… my family. When my parents were working, my grandmother was their equivalent. There was a sense of belonging at home, even though at school I was told differently. My grandmother would always comfort me and say it's all going to work out one day. As a kid it made me realize: 'Maybe she's right, maybe it will.' The DNA of having discipline, ambition, making someone else proud and believing in yourself doesn't have to come from business, it can come from nurturing. Success Tip: Don't focus so much energy on what you've lost, focus on what you need to win. There will be times when you may lose $1 million in deals. You'll think it's the end of the world, but the next day you may make $1.2 million. Nothing is meant to always work out. You just need a Plan B. On staying competitive: Many [business] people focus on what is static, black and white. Yet great algorithms can be rewritten. A business process can be defined better. A business model can be copied. But the speed of execution is dynamic within you and can never be copied. When you have an idea, figure out the pieces you need quickly, go to market, believe in it, and continue to iterate. Biggest business influence: The best CEO of our time, Steve Jobs, for his vision and mastering the execution of it. My proudest moment… was seeing the look in my father's eyes when I told him that I sold my second company [for $300 million]. He didn't have to say anything. On defining moments: You'll probably have two or three really bad days in a year. Those are pivotal points where every decision is instrumental. You have to have a very thick skin and be more focused on solving the problem than worrying about it. Stress-taming tactic: I disconnect from technology for a weekend, generally once a month. You almost need to so you can think and appreciate what really matters in life – family, friends, your health. I let loved ones know where I am, in case anything happens. But if something does go wrong then I'm not doing my job right, because I should be hiring people who can problem-solve on their own. Attitude adjuster: When my grandmother passed away I created a slideshow with pictures of her and me. Anytime I need motivation or hit an obstacle, I replay it. Advice for young 'treps: People still stereotype all day long. But if you forget your own age, you'll get so focused on the business that you become ultra-confident and people will forget to question how old you are. Biggest challenge: We have 120 amazing [employees] and we're growing fast, so it's about finding the next 120 people who share the same culture. I'm a true believer the assets go home at night -- and your assets are your people. When faced with rejection… embrace it. This will change the entire way you look at life. Whenever someone says they're not interested in working [for me] or buying [from me], it fuels my competitive side. It may not be today or even next year, but I will carefully design a strategy to get a 'yes.' And when a 'yes' fuels you more than the actual deal or opportunity, you can embrace rejection in a much more competitive way. Favorite book: [Sun Tzu's] The Art of War has a way of broadly looking at life and I've incorporated it into my business philosophy. Secret quirk: I love Twinkies. I stay away from them as an adult, but I had a love-hate relationship with them as a chubby kid growing up. Last time I had one was three years ago. You can't just have one. A big turnoff is… when people approach me and say, 'I have a million-dollar idea and it's going to be amazing.' They think just an idea will make them millions. That's not the way business really works. It's about executing the hell out of your idea -- better than anyone else. What's next: We're launching two massive projects by the end of the year where we'll get closer to the consumer and help make advertising more like information. We're also aggressively expanding internationally. We'll launch in Australia, Canada and France in the fourth quarter. With that, based on the way revenue and profit grows, [RadiumOne] could be on a 12- to 15-month track to an IPO.